Use of our extensive library is available to members only in the UK. All of the books and journals listed are available from the Library. A DVD containing The Cumulative Index and Journal back issues is available for sale. Library List download: November 2015 Edition [86Kb]. BPS Quarterly Bulletin: Journal of the British Postmark Society. All of the journals listed above are available from the Library, photocopies of articles can be supplied at 10p per page plus postage. 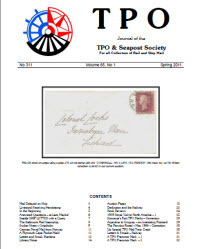 Back numbers of "TPO", complete with an index, are available on a DVD, copies of which are available from the Secretary. Bound copies of back numbers of TPO Journal are held in the Library, but owing to the fragile state of the earlier volumes they cannot be lent out, however articles from these volumes are available as photocopies. Donations of material for the library are always gratefully received. Authors of articles, monographs or books are encouraged to send copies for review in TPO and for subsequent inclusion in the library of the Society. Suggestions from members regarding additions to the library are also welcome.